Asked if he was grandstanding when he got into a confrontation with the GOP presidential frontrunner, Ramos said absolutely not. 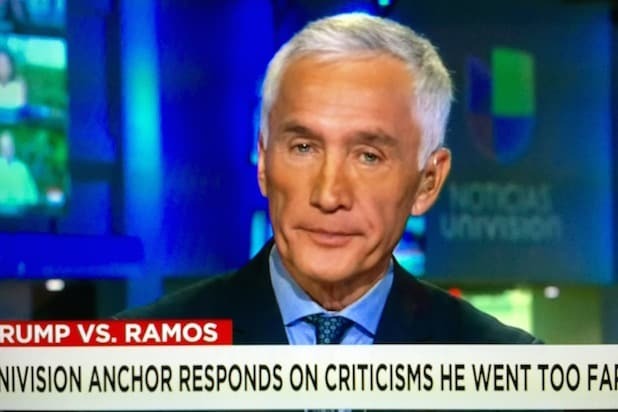 Ramos said he specifically went to Iowa because Trump wouldn’t agree to an interview. After Ramos was kicked out of Trump’s press event, the business mogul told reporters Ramos was “out of order” but that he had no problem if the newscaster wanted to return. The journalist was soon seen back in the room and began a heated on-camera exchange with Trump over immigration. Ramos said Trump’s rhetoric is creating a dangerous environment. Ramos also answered a question about whether it was true that his daughter works for the Clinton campaign. “Does it affect your coverage of Trump?” Anderson asked.